“Will I get a chance to meet him! ?” exclaimed a nine-year old, whose wide eyes were fixed on the entrance of Resorts Casino, as he stood on his toes in attempt to see above the crowd. 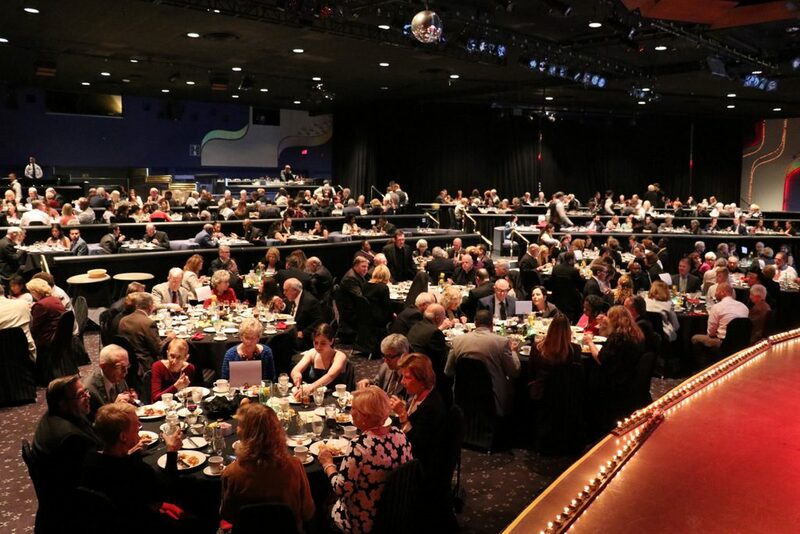 Around him, the room filled with the chatter of over 400 people who Catholic Charities welcomed at their 14th annual Justice for All Dinner and Awards Ceremony at Resorts Hotel in Atlantic City – all of whom shared the same anticipation of one exceptional individual’s arrival. This voice came from Abduljabbar, a young refugee from Syria, who was referring to the evening’s main honoree, Cardinal Joseph Tobin, Archbishop of Newark. Abduljabbar was one of tens of thousands of refugees whom Cardinal Tobin has fiercely defended on a local and international level. The face of another young refugee was pressed against a window overlooking the Atlantic. “I’ve never seen the ocean before,” she whispered, shortly before her younger brother excitedly grabbed her clothing and pointed towards the door. Beaming from ear-to-ear, Cardinal Tobin entered the room, as heads turned and conversations came to a pause. He gracefully made his way around the room, warmly greeting and conversing with priests and nuns, agency staff, and guests – to the delight of everyone he encountered. 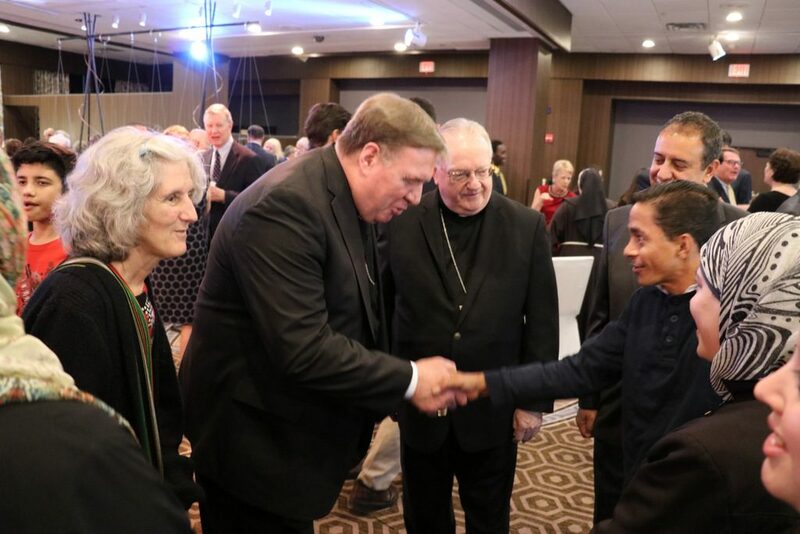 Perhaps no one’s eyes lit up brighter than Abduljabbar’s, whose wish came true, as Cardinal Tobin and Bishop Sullivan approached him and the other refugee families in attendance. These were families, forced to flee their homelands due to war and persecution, who had come to South Jersey from across the globe and recently resettled in South Jersey through Catholic Charities. Cardinal Joseph Tobin and Bishop Sullivan welcome Mohammed Ali, a refugee from Syria who attended the event with his family. Staff made the introductions, as Tobin humbly bowed his head, and reached out with both hands to greet and welcome each and every one of them. Two bothers’ jaws dropped as they exchanged looks when Tobin spoke a few words to them in Arabic. As guests made their way to Resorts’ Starlight Theater, they were treated to the sounds of Holy Spirit High School’s choir and musicians, positioned outside the entrance, filling the halls with “God help the Outcast”. CBS newscaster and reporter, Pat Ciarrocchi, served as the emcee for the evening. Dinner was served following a welcome and invocation by Father John Thomas, Pastor of Saint Monica Parish in Atlantic City. 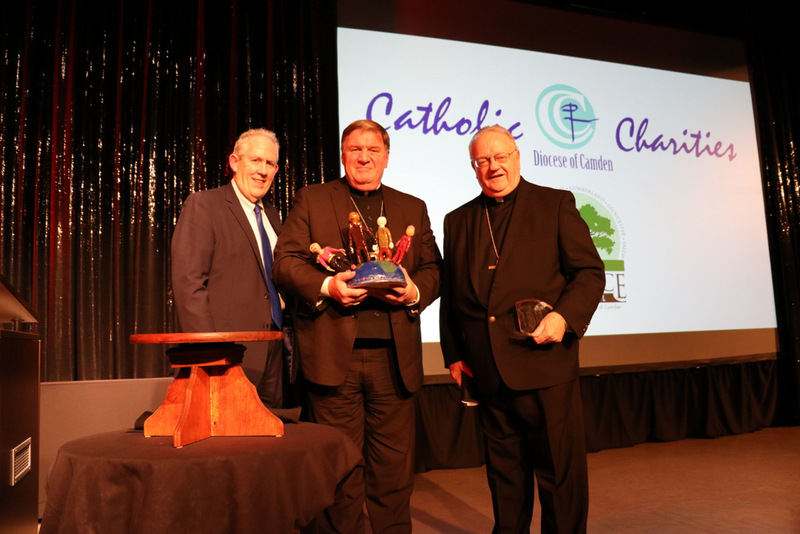 As the awards portion of the evening begun, Kevin Hickey, Executive Director of Catholic Charities, Diocese of Camden, explained just how consequential the fundraising dinner was to the 33,000 individuals assisted by Catholic Charities annually. Referencing Matthew 25, he explained the core mission of his agency: providing aid to the poorest and most vulnerable. “This includes mothers and children who are victims of domestic violence, veterans coming home from war who need housing and employment, refugees who arrived here with nothing but the clothes on their backs, and people who have lost their homes to disasters.” Hickey also explained the significance of the Share the Journey campaign – a two-year campaign that was launched by Pope Francis in support in migrants and refugees in light of the global refugee crisis. Offering first-hand testimony to the tragedy and triumph of immigrants who come to this country, was Moustafa Aloodri – an Iraqi refugee who now works full-time at Catholic Charities. 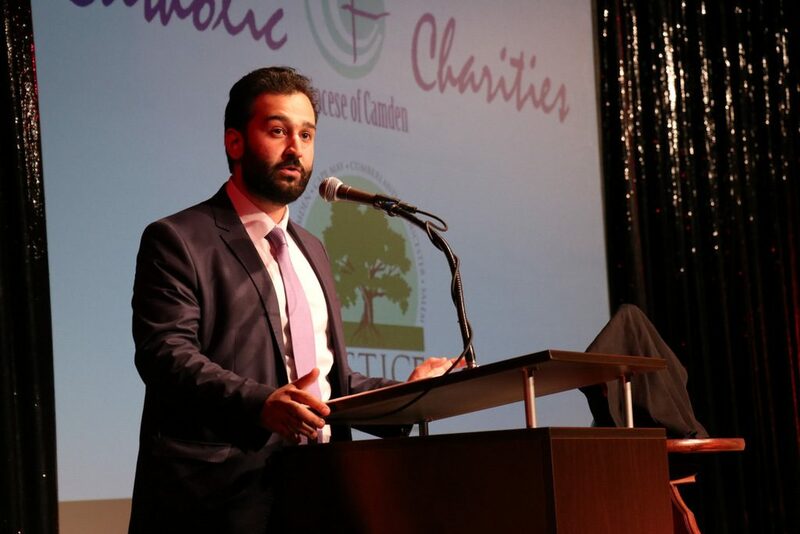 Offering first-hand testimony to the tragedy and triumph of immigrants who come to this country, was Moustafa Aloudri – an Iraqi refugee who now works full-time at Catholic Charities. A part of the event, five local honorees from across the Diocese were recognized as “Disciples of Mercy” for their exemplary spiritual and corporal works of mercy in the Camden Diocese: Margaret Steadman of Saint Monica Parish in Atlantic City; The Gardening Angels of Mercy Community Gardeners of Mary, Mother of Mercy Parish in Glassboro; Nancy E. Whatley Griffin, Esq. of Sacred Heart Parish in Camden; Michael Ciccotta of Saint Thomas More Parish in Cherry Hill; and Joseph Sosnowsky of Saint Damien Parish in Ocean City. Bishop Sullivan presented the Cardinal with a crystal plaque of the Saint John Neumann award. Saint John Neumann, former Bishop of Philadelphia, is the patron saint of immigrants. 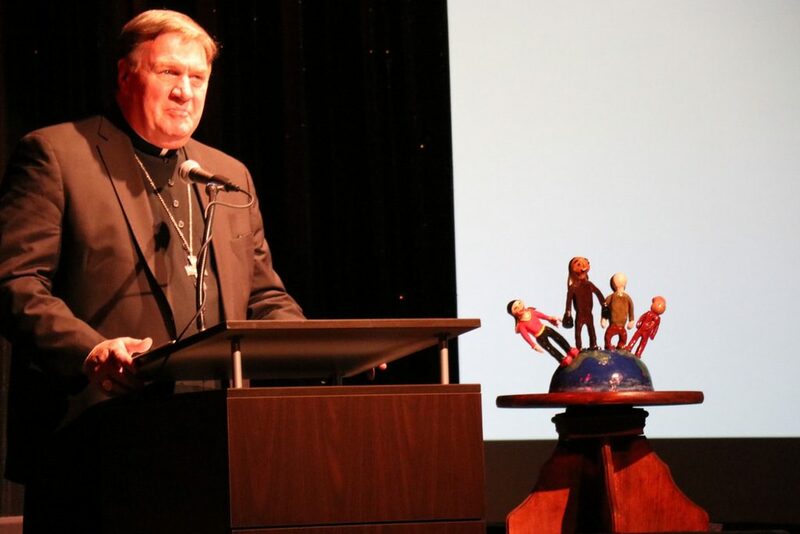 Four teenage refugee girls from Syria, Afghanistan, and Pakistan unveiled a personal gift for Cardinal Tobin – a clay sculpture that they crafted of four people holding hands on top of a globe. The sculpture rested on a wooden display stand made by a Syrian refugee carpenter. Moved the gift, he thanked the girls, and the room fell silent as he spoke. 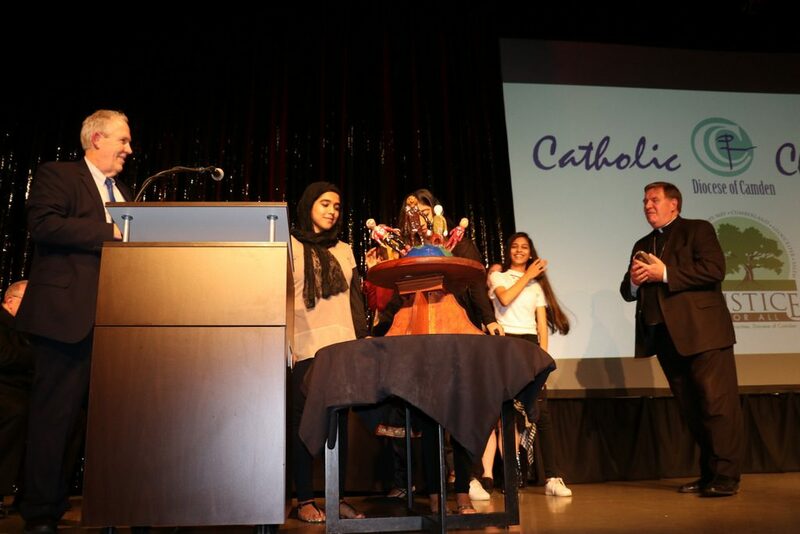 Four teenage refugee girls from Syria, Afghanistan, and Pakistan unveiled a personal gift for Cardinal Tobin – a clay sculpture that they crafted of four people holding hands on top of a globe – a recreation of the symbol for “Share the Journey”. The sculpture rested on a wooden display stand made by a Syrian refugee carpenter. The evening ended with a thunderous round of applause and standing ovation, before Sister Agnes of the Franciscan Sisters of the Renewal and Cardinal Tobin closed the event with a final prayer.